Who Will Rebuild Baltimore? Taxpayers? I Have a Better Idea. Right Wing News reported yesterday, “The City of Baltimore has done a preliminary cost analysis of the recent riots and decided that the damage amounts to some $20 million. And now the city wants to send the bill to FEMA and have all the rest of us pay their bill. Henry J. Raymond, Baltimore’s finance director, said the city can temporarily cover the costs from its rainy day fund while seeking reimbursement for up to 75 percent from Federal Emergency Management Agency. Both Gov. Larry Hogan and Mayor Stephanie Rawlings-Blake have requested federal aid. All of this, AFTER the Mayor who’s yet to accept an ounce of responsibility, tied the hands of police officers and allowed looters and rioters “room to destroy”. She, along with Governor Hogan honestly expect taxpayers to pay for the damages? I’ve got something else in mind. Where I come from, you break it? You fix it! Baltimore needs youth programs, right? How about instead of granting “amnesty” to the “children” arrested for basically destroying their city, you put them to work? Don’t coddle them and help them play the poor, victim card! Hold them accountable for the destruction they caused and make them rebuild the city they destroyed. Police Officers, along with construction crews will oversee the work and during this time of self-reflection and community service, they might learn a valuable trade. If they refuse to do the work, they get a one-way ticket right back to jail. THIS is leadership! THIS is mentorship & helping young adults break away from a crime ridden lifestyle into something productive. I always hear about my “white privilege”. Let me tell you something about my “privileged” life. I was raised by a single mother who didn’t eat at times so her children wouldn’t starve. She worked minimum wage, raising three children; slowly working her way into Management at Wal-Mart. Yes. I said Wal-Mart. At the age of 11, I took care of my younger siblings because my Mom couldn’t afford a babysitter at the time. When I turned 13, I started babysitting the neighbor’s kids for extra money. At the age of 15, I started my first real job at Dairy Queen. When I was able to drive, I worked two jobs in High School to help take the load off of my Mom. I provided for myself and helped buy my siblings school clothes, along with other necessities. How’s that “white privilege” sound so far? I want to share something I’ve learned over the years. Although I grew up poor, my Mother taught me how to be independent, but most of all she taught me respect. Respect for myself and for others. If at any time I tried to pull what some of these “kids” in Baltimore did; rioting, looting and burning my city? My Mother would’ve turned me into the Police within two seconds flat – well, after she beat me within an inch of my life. Not only would she expect me to pay the consequences for my actions, she’d dare me to make an excuse. It’s called “tough love”. I guess that’s the difference in today’s generation of parenting. Too many parents want to make excuses for their children’s bad behavior instead of holding them accountable for their actions. Perhaps if we hold our children accountable, then we, as parents, must shoulder the responsibility of holding ourselves accountable as well. Is that where the problem lies? Parents not wanting to face the harsh reality of disciplining their children? If this brand of parenting continues, we’ll be left with an entitled generation of brats who have no respect for themselves, let alone others. This breeds a lifestyle of no self-awareness or motivation to make something out of their lives. Believe me. I’m as protective as the next Mom, maybe more so than most, but I do realize at some point, I’ll have to force myself to cut the cord and allow my son to be a man when the time comes. Parents…Come on! We’re doing our children a disservice by not allowing them to own their behavior and face the consequences of their actions. One day we may not be there to bail them out. Is that how you want your child to grow up? A victim, always blaming someone else and never accepting responsibility? It becomes a vicious cycle that will negatively affect your child’s future. We’re fierce, strong parents who need to introduce the very same values our parents instilled in us as young adults. Look around Baltimore. What do you see? Your city nearly burned to ground with no consideration for residents or business owners who lost their homes and livelihoods. For What? Justice? How’s destroying your community and the people within it, justice? It’s not! And to the Mayor asking the taxpayers to foot the bill for the damage these young adults caused? Do you think that’s fair? Is that “justice”? I don’t think so. Maybe it’s my “white privilege” that helped me make the right choices in life. Or just maybe it was a loving Mother who cared enough to discipline me when I was wrong and force me to learn the hard way; my choices in life have consequences. Regardless of what I’ve done in my life, my Mother has always stood by me. She’s been my rock throughout the greatest trials of my life. If having a loving and supportive Mother is considered “white privilege”? I’ll wait for a card to show up in my mailbox. This isn’t a race issue America…It’s a community issue. A parenting issue. Something that can be changed if everyone comes together and holds each other accountable. Be the change you want to see in the world. Don’t expect someone else to do it for you. If you do, you’ll be waiting a long time. Government most certainly isn’t the answer. I hope to see a beautiful Baltimore; rebuilt by the little protestors who decided to burn it down. Wake up parents! Do what your Mom and Dad would’ve done…hold your kids accountable. Keep their little tails off the streets and force them to see what’s happened to their community through new eyes. They may not like it now, but they’ll thank you for it later. Think of their future…and what a bright future it may be! God bless all parents, struggling just to make it; for He is with you always. Love, compassion and discipline is the answer, my friends. If you take anything from my article, please remember this: Be the change you want to see in this world. 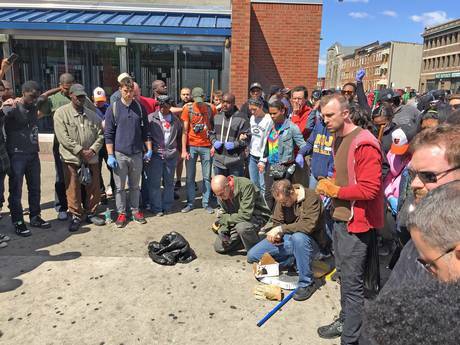 I found this image of Baltimore residents taking a moment to pray before clean up. It touched my heart. Luke 18:27 “What’s impossible with men is possible with God.” Amen. FEMA funds should be only for natural disasters or acts of terrorism , not self-inflicted damage caused by rioters. Are Illegal Immigrants Responsible For The Measles Outbreak?